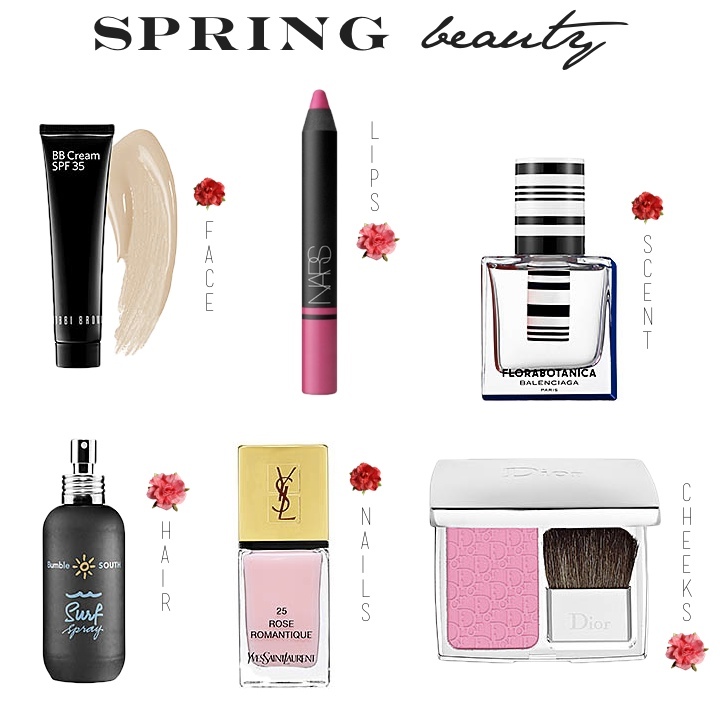 now that spring is here i've been lusting over a few beauty products. bb cream is something i use on an everyday basis and will be perfect for spring. it's lightweight but still gives enough coverage for a smooth natural finish. love giving my lips a pop of color in the spring. the satin lipstick gives just enough shine. it's not too matte or too glossy. with the season change i love to switch our my musky scent for a more floral scent to match the season. the surf spray is a quick and easy way to give texture and the "i just got out of the beach" look to your hair. the awakening blush looks pretty intimadating with the bubble gum pink, but once you apply the blush it will customize it to your own complexion. you no longer have to go looking for the perfect blush. this blush will do all the work for you. perhaps it's time for a sephora run? i have the dior blush and i like it a lot! i will definitely have to check out the ysl nail polish, the color is beautiful! I've heard very good things about these BB Creams that are on the market. I'm happy that you recommended a specific brand. Must investigate. I'm also intrigued by the surf spray. What a beautiful roundup. PS~I'm looking at your Instagram feed on the right and it seems like I've missed so many of your photos!